Our cruise up the Hudson started out with the magnificent trip by Manhattan after our photo op with Moon Beam. The day was hazy, but the view was still amazing. Then the Palisades on the NJ side. Before we knew it, we had left the cities behind and were surrounded by beautiful hills and trees. The railroads own right of ways down both sides of the river, so there is very little development on the waterfront. We passed West Point and Bannerman's Island, reminiscing about our 2009 cruise up the river with Fred and Linda (Young America N-37). As we passed Newburgh, where they have a condo, I gave Linda a call knowing full well that they were on their way south to their boat. I left a message and a short time later got a call back. Fred and Linda's departure had been delayed and they were indeed in Newburgh and were ready to drive to where ever we might dock to pick us up for dinner. Just then we were passing New Hamburg Yacht Club. 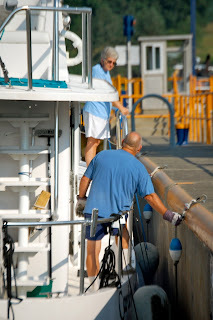 After a quick phone call, we were docked and soon after Fred and Linda arrived as promised. We had a great Thai dinner in a nearby town, but mostly we enjoyed catching up with our "looper" buddies. We'd been putting in some long days, so when there were predictions of thunderstorms we decided to make a short day the next day and anchored in Rond Out Creek near Kingston. We'd been to the museum in Kingston on our last trip, so we spent the afternoon watching the storm clouds come and go without hitting us with anything too bad. Tuesday morning we started out with the first locking of the day in Waterford. Going west from Waterford there are five locks in less than two miles that raise you up a total of about 170'- the highest lift in the shortest distance in the US - world maybe? Hard to remember the details of all the superlatives. Each of the locks raises the boat thirty-some feet. 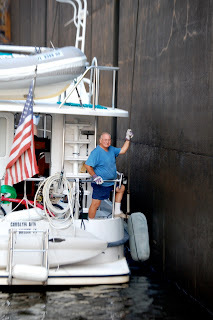 When the lock master first starts the lift, the water just boils - kind of like being in a giant jacuzzi. To control the boat you either wrap a line around a cable or pipe, or grab a rope that is dangling down the side and use a boat cleat to help you hang on. 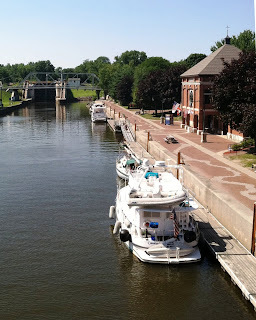 The first part of the canal is actually now the Mohawk River and is very scenic. As we traveled from lock to lock, the lock master at one lock would tell the next one down the way how many boats were on the way. In most cases, you might as well travel at the speed of the slowest boat in your lock because even if you get to the next one ahead of the others, the lock master will wait for all the boats before locking. Two of the boats in our group never seemed to realize that. They were in the back of the first lock and decided they couldn't deal with the "ridiculously" slow speed the rest of us were going. So they proceeded to zoom past, throwing a huge wake, rather than calling on the radio to discuss a "slow pass" as most do. It was great to see them having to wait for us at the next lock, and the next, and the next... All the boats that we'd spent the day with stopped after 10 locks at Guy Park in Amsterdam. We'd stopped there on our last trip and weren't too happy with it, so we pushed on through two more locks and stopped in Canajoharie. Besides having a dock with power, it put us in a position of locking by ourselves for the seven locks we did the next day. We had decided to move quickly on this portion of the canal since we had stopped many places along here two years ago. After we crossed Lake Oneida, we stopped at Winter Harbor for the night. It was time to rig the boat for the western part of the canal and it's low bridges. Remember the song? "Low bridge, everybody down..." Joe soon found a couple strong, willing folks to help lower the radar arch. Sorry, Bruce, it was much easier than rigging the mechanism - but it's up there in case we need it! Once the arch was down, we also had to lower the davit that lifts the dinghy and secure it. Just in case there was any doubt, Joe also rigged a boat hook on the bow pulpit with its top 15 feet above the water. This way he can bring the boat up slooooowly to any questionable bridge. If the boat hook clears, we know everything else will. The next day we came to the Oswego Canal intersection. Last time we took the turn to Oswego and Lake Ontario, this time we headed toward Buffalo. A short time later, we decided to take the turn to Lake Onondaga through which we could reach Syracuse. This is the beginning of the Finger Lake region which we'd heard so much about. 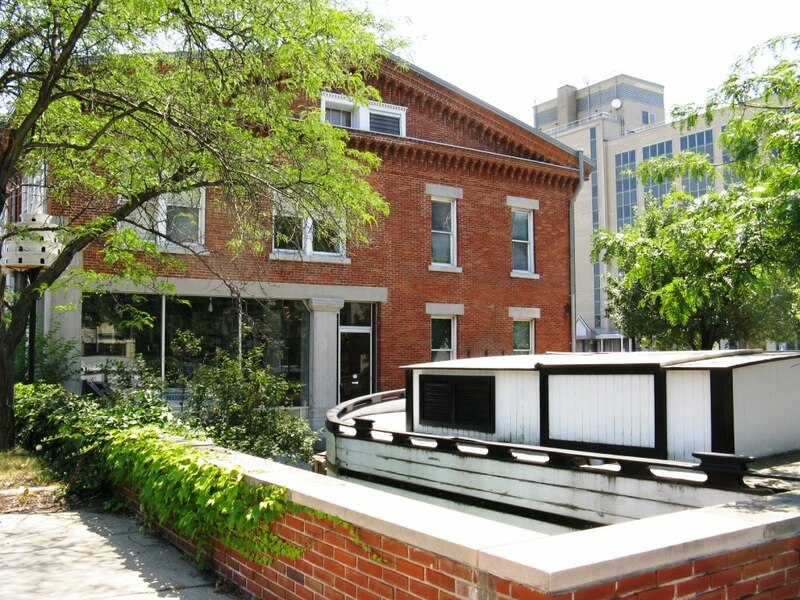 After crossing Lake Onondaga, Syracuse Harbor is reached through a small canal which is crossed by several bridges. The problem here for many boats is the bridges are low - and so is the water. Joe saw the water depth get down to less that six feet - we only draw about three - but the boat hook only cleared the lowest bridge by about six inches. If the water level goes up, bridge clearance goes down. Once we arrived at the Syracuse harbor we found a long, empty dock - with free power. The waterfront is a work in process and you can't really reach much on foot, so we rented a car for the weekend. The original Erie Canal ran right through Syracuse and now there is a nice museum in a building that used to be a weigh station. The collection of fees for transporting goods on the canal and then loaning out the profits locally was the beginning of our nation's banking system. After the canal museum we drove up to the Salt Museum on Lake Onondaga. 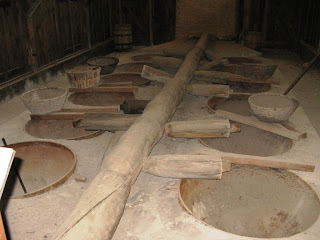 This area had salt springs and became a large producer of our country's salt. The process involved pumping the salty water through wooden pipes(they used wood because of the highly corrosive salt brine) into vats and then boiling the water out. 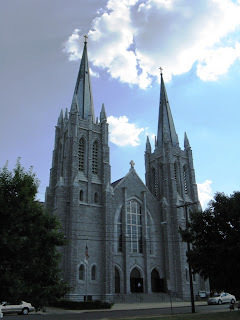 Nearby was a re-creation of St. Marie Among the Iroquois, a Jesuit mission. 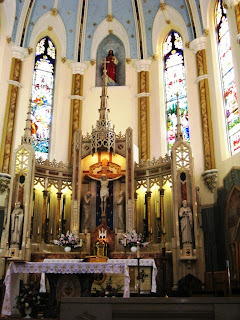 When we picked up the car we had seen a Catholic Basilica nearby, so Joe decided to try to catch a Saturday afternoon mass. We arrived at just the right time - and the mass was even in English - they have some in Polish also. The church was every bit as striking inside as outside. Later, as we drove around (looking for Starbucks!) we passed the Niagara Mohawk Power building. All thoughts of caffeine were forgotten as we stopped for numerous photos and lots of gaping at the art-deco structure. Later we came back for a picture with the lights on. They were all white that night but we were told they often change the colors for holidays. The next day we took a driving tour of Lake Skaneateles (sounds like skinny-atlas), one of the land-locked finger lakes. We circumnavigated the lake and saw some stunning views - but there was rarely a place to pull over and take a photo. Although it was quite warm and everything was very green, we were reminded that we were in upstate NY when we saw these crossing signs. The town of Skaneateles has a dock, shops and restaurants. Along the dock there were "did you know...?" signs where we learned that the water is so clean in the lake it is used for drinking water without filtration. On the way back from Skaneateles, we stopped to visit Mrs. Turner - the mother of a friend. She's 90 years old but doesn't miss a beat and lives in a beautiful house that was built in the 1860's. The original cherry woodwork and leaded glass door were gorgeous. Interestingly, she also has one of the old salt vats in the yard as a planter. At the canal museum we had purchased a book about the Erie Canal with an emphasis on architecture. One house mentioned in Syracuse really looked interesting, so we decided to go look for it. It was worth the trip. This may be my all time favorite. It was built in 1894, designed by George Franklin Barber who sold plans through catalogues. There's an odd piece on the roof that we couldn't figure out. Maybe just a decoration. As we were leaving a man came out the door and picked up a paint brush and started in on the porch railing. He must just constantly paint - once you finish, it's time to start again. The next morning, Joe returned the rental car as soon as the place opened and we left the dock under dark clouds. We thought the storms were going to come through later and Joe was concerned that too much rain would trap us in Syracuse since there was that low bridge to go under. We made it under the bridge and into Onondago Lake when the sky let loose. Visibility went to near nothing and just as I was about to mention that radar was a wonderful thing, Joe reminded me that with the radar arch folded to get under the bridge we have no radar. It was a short storm and an empty lake so no drama. 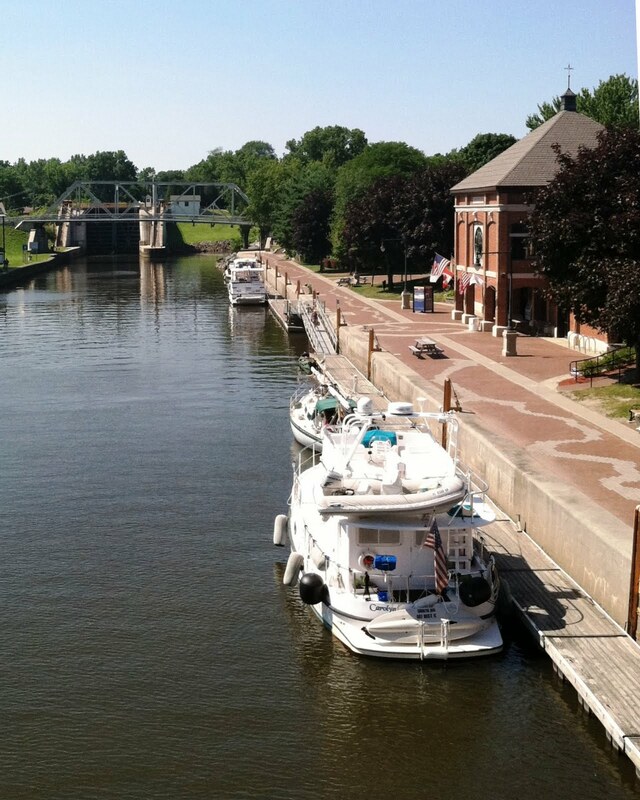 Once back on the Erie, we went through one lock and with more storms in the forcast decided to stop in Baldwinsville. It was another free wall with power - 50amp $10/day honor system. Early in the evening, a storm came with a simultaneous crack of thunder and flash of lightning. The power went out for a few hours all over town, but luckily the woman in the boat behind us was incorrect when she thought that Carolyn Ann had been struck! Lyons was our next stop and thanks to Bettie and Klaas we knew to check out the Old Jail Museum. It was a bit of a climb up the hill, but well worth it. The jail was built in a residential neighborhood and looks like a house. Actually, besides the prisoners, it did house the sheriff and his family. The jail was built in the 1800's (Joe and I both missed the date! ); it was later updated with indoor plumbing and used as the county jail until 1960.Although the cells were only the length of a cot and maybe twice as wide, the reason for the closure was over crowding rather than the living conditions. Our docent told numerous stories about inmates and also about visits of former inmates or their descendants who added new details to the stories. Besides the jail related exhibits, they have many old wedding gowns, archaeological relics, war mementos and old farming tools and equipment. 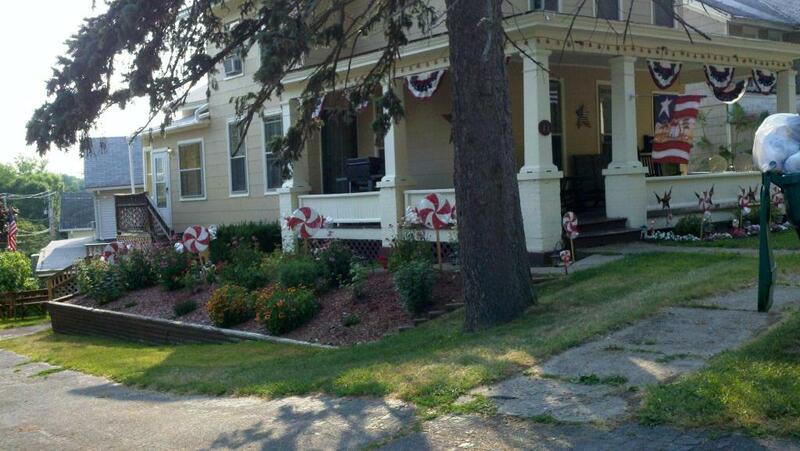 Lyons was originally best known for its peppermint. The old Hotchkiss Essential Oil building is still standing and currently under renovation. According to our docent at the jail, the last descendant passed away recently and left the building to the county. When the historians went in they said it looked like someone had just locked up one day at the end of business and never went back. We may have to come back next year! By the time we finished touring Lyons it was around noon and HOT. Since our next stop wasn't far, we did some indoor chores and moved to Newark later in the day. The western part of the canal is located where the original canal was in most cases. This means that the towns are right on the canal and the tow path that was used by the mules and horses is now a nice canalway path for walking and biking. Most of the towns are boater friendly - with the free docks and often free power, pump-outs, restrooms, showers, even free laundries. There is also a project called Mural Mania to paint murals along the canal. In Newark there is an expecially good one at the town dock. Again thanks to Bettie and Klaas, we went to a great museum. This one was the Hoffman Clock Museum housed in the Newark Public Library. It would've taken days to read all the information about all the clocks - but it was all so interesting! If we had to pick a favorite it would be the cannon sundial (ca. 1650), that had a magnifying glass attached. At noon the sunlight through the glass would generate enough heat to touch off the gunpowder in the cannon! Another clockmaker had quite a sense of humor. The clock chimed on the hour, and then again two minutes later in case you missed it. On Tuesdays a volunteer comes in and winds all the clocks that still run. Several chimed on hour when we were there on a Thursday, but not all because many are only 30 hour clocks. Have to plan a Wednesday visit sometime. In our book I had found several houses I wanted to see in Newark. Joe and I went together to the first one. 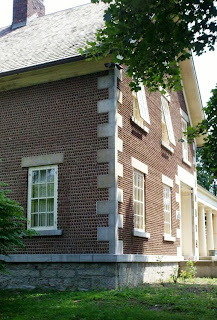 I was quite surprised to see it - in the book it was a conservative yellow with white trim and no porch! I think they even replaced the roof shingles. Joe pedaled off to get a hair cut and I took a walk to see the cobblestone house that was pictured in the book. Evidently when the Great Lakes receded they left behind lots of small, smooth cobblestones that the farmers had to remove from their fields. I remember all the stone walls in New Hampshire that were made from clearing the fields, but this was new to me. I guess it was fairly common in upstate New York and Ontario. Anyway, here it is. We moved a big nine miles to our next stop - Palmyra, former home of Joseph Smith who started the Mormon Church. We didn't go see his former home, or any other Mormon sights, but we did go to the four museums in the downtown area near the town dock. The first museum was crammed full of memorabilia seemingly concerning anything that someone in town might have had some interest in. It really had some good old photos for local history, and I'm sure if you were from the town they would be even more interesting. One thing we thought was interesting was this typewriter. It was actually designed so that you couldn't type too fast to avoid the letters getting jammed. The second stop was the old Phelps General Store. William Phelps, his wife, daughter and 14 day old son Julius purchased the 1826 boarding house/tavern/bakery and turned it into a general store and their living quarters in 1875. Located right on the canal, he evidently did a good business and made some improvements - like gas lights and stove. Eventually his son Julius took over - and made no more improvements. In 1940, no longer able to compete with more modern stores, Julius closed the doors. He didn't clean out the store, he just locked the doors. There are eggs on the counter that have been there since that time. After Julius and his wife passed away, their daughter Sybil was left in the house, with her 13 cats. She passed away in 1976 - at 81 - never updating the living quarters. There was no electricity, no running water other than a cistern and pump to get water to a sink. Because of leaks in the original roof - never replaced - and the cats, the wallpaper, rugs and upholstery has been replaced but the house is essentially as it was left. It was incredible to think of someone living that way so recently. After the Phelps store we took a quick tour of the un-air conditioned print shop and then moved onto the Alling Coverlet Museum. The museum is home to the largest collection of hand woven coverlets in the country. They also had a large loom to give an idea of the complexity of the weaving process. The heat, like everywhere I guess, has been oppressive. Our thermometer has registered over 100 degrees several days in a row now. They're complaining about the humidity also - which compared to DC seems moderate. We've been trying to do our sightseeing early in the day and hibernating in Carolyn Ann in air conditioned cave mode during the afternoon. The heat is supposed to break soon via a "disintegrating cold front" due to come through. Nice posts guys. I am enjoying our current schedule and location, but there is a piece of me that would like to do the canals. Hope to see you in FL this fall.